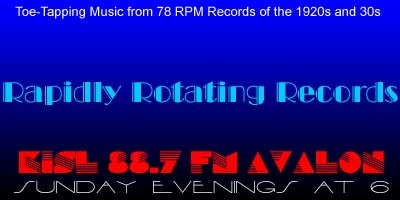 Don’t be alarmed, but this week’s edition of Rapidly Rotating Records does not start off with our usual theme song of “Avalon.” Just for this week it starts with Guido Nielsen playing Joseph Lamb’s “American Beauty” rag. Why? Because this week’s show is a brief summary of last week-end’s 32nd annual West Coast Ragtime Festival, which we had the great fortune to attend. This week’s playlist will consist of vintage recordings of some of the tunes we heard at the festival, including some which will be totally unexpected, but I think you’ll enjoy. If you enjoy the show, please let us know by leaving a comment on the website or the Facebook page or sending an email to Glenn@RapidlyRotatingRecords.com. And remember, your requests and topic segments are always welcome. As always, just click on the link below to instantly listen streaming online and/or download the show. The Rump Steak Serenade – Fats Waller and His Rhythm / Fats Waller, v.
Get Out And Get Under The Moon – Nat Shilkret and The Victor Orchestra / Johnny Marvin, Frankie Marvin, v.